The ultiduo/mge lord yet again.. Ever since the second tournament I've received SO MANY requests to make another one that I couldn't delay it anymore. This time around we are going completely clear of any organisations - and it looks very promising that we will deliver even better quality of a competition and entertainment than before, especially with our special playoffs coverage. But that later, I have to finish this intro first, therefore I present to you.. The Ultimate Ultiduo Tournament 3! Better maps & better rules! I did my utmost to take the best of the previous tournaments - BO5 for Grand Finals was way too strenuous, on the other hand 3 maps only to choose among was insufficient, which resulted in rules that not everybody favoured. In addition, we've taken a brave step and banned resupplying (load_itempreset or changing cosmetic in spawn in order to respawn). All of the rules and map changes you can find below. Sorry NAs, we still only cover Europe at this moment. The reason stems from the fact that I cannot secure a prize pool and coverage for North America, otherwise I'd gladly host one for you in parallel with EU. Everyone can sign up for EU, of course, but keep in mind the ping disadvantage. 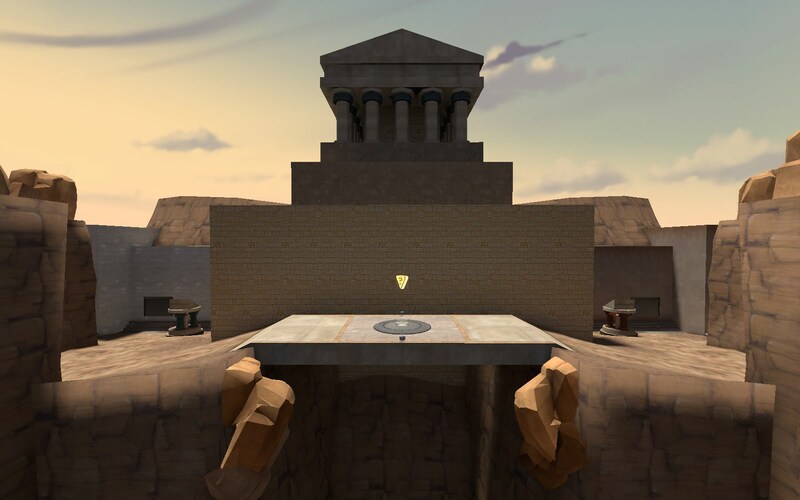 Acropolis has been suggested to me by the mapmaker in the first tournament, and I didn't refuse quite kindly (sorry). I thought we could give it a try in a competitive environment and see how it plays out, everyone that I played it with enjoyed it quite a lot in fact. All rules, as well as further information including signing up, you can find here. I will cover the signing up process below as well, which has also been changed a tad bit. The tournament will be produced and covered by Lucky and a small team of other beer-addicted brits, the Playoffs stage and the Grand Finals will be streamed from a live studio where you can see live on camera reactions from the casting couch as well as watch them make their (most likely incorrect and intoxicated) predictions as to who will claim the title as the kings of nerdy-duo. Melkor.tf DM reserved slots for the top 16 teams, generously donated by maly! serveme.tf premium codes, very generously donated by Arie! Donations of 5 keys and more will be rewarded with a precious glowing helper medal and a special role in the discord, with all of the donations going towards the prize pool! You can donate to this cool guy. All the medals you can find here. I will handle the rest. If you choose to sign up through the discord, you can find the steps there. List of all the participants currently signed up: clicc. Everything that I haven't covered must already be in the rules or in the discord. For any other questions, I'm available and will most likely answer faster there. Sign ups deadline is on 4th April and all rounds will be randomly generated by challonge. Ever since the second tournament I've received SO MANY requests to make another one that I couldn't delay it anymore. This time around we are going completely clear of any organisations - and it looks very promising that we will deliver even better quality of a competition and entertainment than before, especially with our special playoffs coverage. But that later, I have to finish this intro first, therefore I present to you.. [i]The Ultimate Ultiduo Tournament 3[/i]! All rules, as well as further information including signing up, you can find [url=https://docs.google.com/document/d/1NSZQXdDMHeWZ3P2dTqTOGxFQDzf5XV4baMTobK2JIIo]here[/url]. I will cover the signing up process below as well, which has also been changed a tad bit. Donations of 5 keys and more will be rewarded with a precious glowing [url=https://imgur.com/1uZGVO8]helper medal[/url] and a special role in the [url=https://discordapp.com/invite/rTNqQAc]discord[/url], with all of the donations going towards the prize pool! You can donate [url=https://steamcommunity.com/tradeoffer/new/?partner=169506116&token=TR0sTTH2]to this cool guy[/url]. All the medals you can find [url=https://imgur.com/a/a8UX2]here[/url]. I will handle the rest. If you choose to sign up through the discord, you can find the steps there. List of all the participants currently signed up: [url=https://docs.google.com/spreadsheets/d/1-1BY02kj_pbvkNDQZiB10QxTyyHugMOJxlpLERAAsiw/edit]clicc[/url]. Everything that I haven't covered must already be in the rules or in the [url=https://discordapp.com/invite/rTNqQAc]discord[/url]. For any other questions, I'm available and will most likely answer faster there. Sign ups deadline is on 4th April and all rounds will be randomly generated by challonge. teamname: "Pat a Mat + botling"
hey guys! im the owner/founder of the Creative Team Fortress Online Tour, we're looking for tournaments that can be put under our brand (meaning we just want your tournament to be part of our tour as the first tournament, we're finding worldwide tourneys just like yours for this kind of occasion. and no, we're not taking over anything.) contact me however you can if you are interested! cre-8hey guys! im the owner/founder of the Creative Team Fortress Online Tour, we're looking for tournaments that can be put under our brand (meaning we just want your tournament to be part of our tour as the first tournament, we're finding worldwide tourneys just like yours for this kind of occasion. and no, we're not taking over anything.) contact me however you can if you are interested! We would like to add K-daz https://steamcommunity.com/id/K-daz/ in the team "K→TaK Legacy BLACK"
is this event going to be streamed? fasterthanahamsteris this event going to be streamed?